Individually designed and built by the current owners family in the 1960`s this superior home has much to offer accommodation wise as well as having a southerly aspect beautifully landscaped gardens. 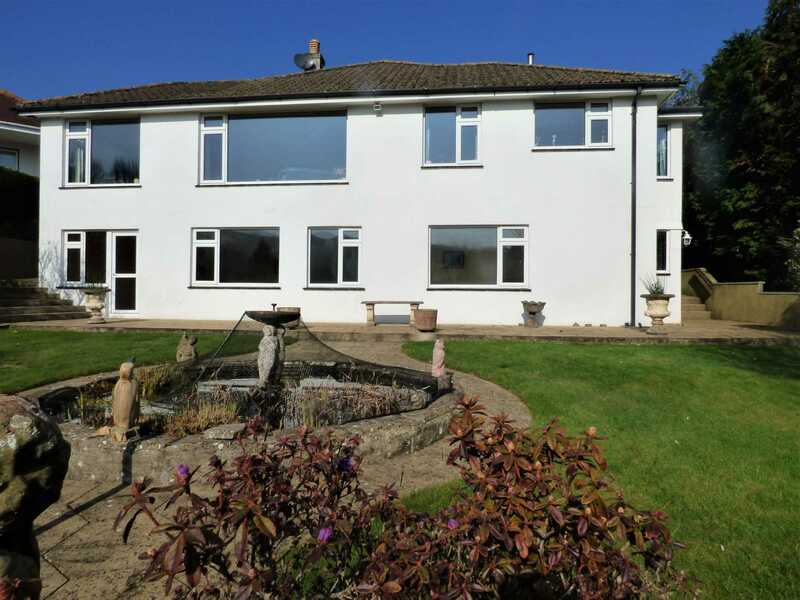 It is tucked off the main Paignton to Totnes road and enjoys open southerly facing views to the rear across the adjoining countryside with Brake Copse in the distance on the edge of the semi-rural village of Collaton St Mary. The property needs a viewing in order to appreciate exactly what is on offer accommodation wise. 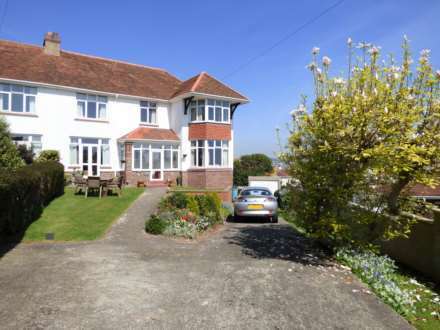 It has the potential for a separate annexe or stream of rental income.The location is superb with Paignton town centre being approximately 2.5 miles distance and Totnes approximately 4 miles. The property is approached via a driveway which provides ample off road parking for several vehicles plus a DETACHED DOUBLE GARAGE. To the front is a large patio area with access to the rear southerly facing landscaped garden laid to lawns, paved terrace, pond and an abundance of shrub and plant borders, again all enjoying a lovely rural outlook. The accommodation is well planned with a large sitting room plus snug with an open aspect from both over the countryside, good size modern kitchen with additional breakfast area, dining hallway plus separate utility room. The master bedroom is well proportioned with built in wardrobes, there is also a large modern en-suite shower room. The remaining two bedrooms are both doubles and have built in wardrobes. There is a further shower room, again well appointed. Accessed from own entrance at Garden level is further accommodation which has over many years been used to provide extra living space. 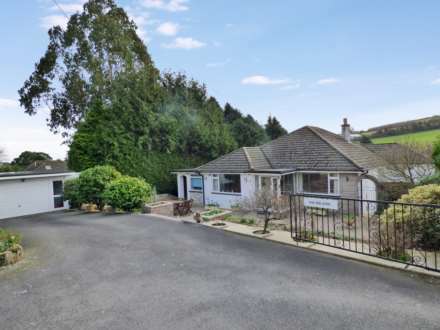 This could easily be converted into a very comfortable ANNEXE or equally to provide an income through letting out, ( holiday or long term) or for a home based office or studio space. Good size light L-shaped hallway. Wall light points. Two storage cupboards with automatic lighting and providing shelving and storage space, plus an additional Linen cupboard. Radiator. Access to roof space with pull down ladder, partially boarded out and electric light. Large picture window to the rear overlooking the lovely southerly facing garden with countryside views towards Brake Copse and beyond. Feature fireplace fitted with a electric fire set beneath a wooden mantle. Wall light points. Two radiators. TV aerial point. Arch way to SNUG 3.58m x 2.36m (11`9 x 7`9) again with window overlooking the garden, surrounding countryside towards Brake Copse. Plumbing and electrics for washing machine and tumble drier. Space for up right fridge/freezer. Work surface. Wall mounted cupboards. Door and window to the front. Good size room fitted with a walk in double shower, with glazed sliding door and an electric shower. Contemporary suite with wash hand basin set into vanity units with drawer and cupboard space beneath and alongside. Mirror over with lighting and shaver point. The vanity unit, with a display shelf continues around to conceal the cistern for the low level WC. Heated towel ladder. Extractor fan. Tiled walls and complimentary tiled flooring. Picture window to the front overlooking the terrace and garden. Fitted to one wall is are two sets of triple door wardrobe units with hanging and shelving space and two having mirror frontage and set either side of a chest of drawer unit. Radiator. Built in wardrobe units to one wall again with hanging and shelving plus a mirror fronted door. Window overlooking the side garden area. Radiator. Well fitted with a walk in double shower with sliding glazed door and electric shower over. WC with concealed cistern set in vanity unit with drawer and cupboard space also inset wash hand basin with mirror, light and shaver point over. Tiled walls and complimentary floor tiling. Extractor fan. Obscure glazed window to side. Heated towel ladder. Accessed externally from the rear garden currently arranged as occasional bedrooms but with some imagination this area could easily be converted to provide additional living space by taking stairs from the hallway down, or keep as a separate ANNEXE, space to work from or maybe as an additional income stream from long term or short term letting. This space is currently split into three rooms all overlooking the rear garden, plus a separate WC, Bedroom 4 11`9 x 10`2 with storage space and wash hand basin. Bedroom 5 8 6` x 8`7 and Room 3 8`6 x 6`7. There is a boiler room and access into a large under house storage area (with limited headroom). In addition with its own door from the garden is the garden room. Tucked off the main Paignton to Totnes road, and approached by a shared private access with lighting leading to own gated driveway with parking for several vehicles. On entering through the gate immediately on the left hand side is additional parking, greenhouses and stone built storage shed. The main driveway leads to a DETACHED DOUBLE GARAGE 7m x 5.18m (23ft x 17ft) with up and over electric garage door plus pedestrian doorway. The garage has been fitted with a work bench, and has electric power and light plus a rear pedestrian doorway and window. Sweeping steps lead onto a large level block paved terrace area which has raised flower borders. Footpath to one side of the property leads to the Annexe area and to the rear garden. Through a gated arch way is a further paved patio area and a brick built shed, this pathway again leads to the rear garden and the Garden Room. 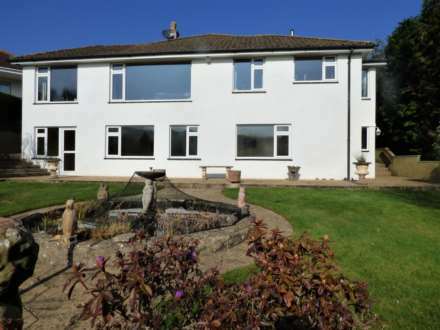 The Southerly facing beautifully landscaped rear garden enjoys a lovely outlook across the neighbouring countryside. The garden has been much loved and created by the current owners to provide a large terrace area opening onto a lawn with pathway around the water feature with steps sweeping down onto a lower lawn. The gardens are planted with a large variety of trees and shrubs providing all year around colour and is a haven for wild life. From Paignton towards Totnes of the A385. Stay on the main road proceed past Collaton St Mary Primary School on your right hand side, just before a sign on your left with Diggers Patch on, just before St Davids Park there is a private driveway, proceed down the driveway, turn left and the property will be in front of you. It is set well back behind the houses on the main Totnes Road.